Whether you’re looking to sell your house in the near future, or you just want a bit (or a lot) of extra space, an extension is a fantastic option for adding value. You can either build upwards, in the form of a loft conversion, or outwards. 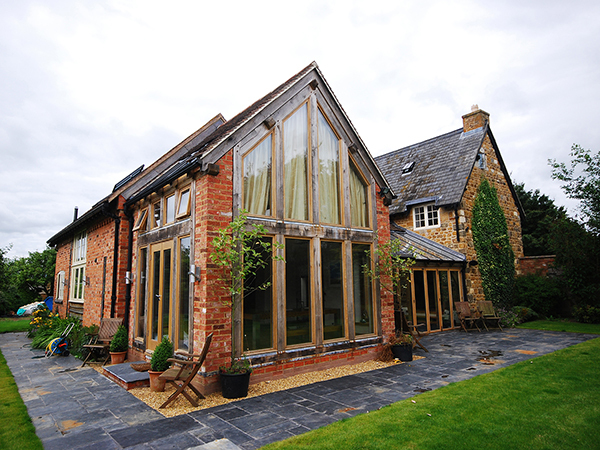 A well-built extension can add thousands to your home, boosting your property value by around 5%. The scope of your extension can vary hugely, from two storey projects that can add a huge amount of extra square footage, or a smaller room or conservatory. Understandably, the amount of added value depends on the materials used, quality of the build, and overall aesthetic. A basic UPVC conservatory, for example, won’t increase your property’s worth as much as a comparable room built with oak and designed by an architect to compliment your house. At Shires Oak, we’ve built many oak framed extensions over the years, from small orangeries and garden rooms, right through to full sized, multiple storey additions to homes. We’re not like other companies because we don’t offer a cookie cutter approach – each and every project we work on is unique and tailored to fit the requirements of our customers and their homes. During the design stage, we’ll take into account the layout, look and feel of your current home, and use our expertise and experience to come up with something that doesn’t just work with your home, but compliments and improves it. A great extension is more than just the sum of its parts! We’re more than happy to visit you to have a chat about how we can help increase the value (and footprint) of your home, and offer you a no obligation quote completely free of charge. The Shires Oak team are based in Warwickshire, but have completed work across surrounding counties, including Oxfordshire, Gloucestershire and the West Midlands – we’re very happy to travel to work on exciting new projects! Just get in touch today and find out how we can help you.